Riding on a wave of rumors and hype, the Samsung Galaxy Note7 has landed. The new flagship will help Samsung venture deeper into several market segments. The Note7 is tough. It’s the first Note to be waterproofed – IP68 rating certifies it for depths beyond 1m. The phone’s metal frame is sandwiched between two symmetrically curved sheets of Gorilla Glass 5. The new Blue Coral option paints the metal and accents in gold, the rest in blue. The Note7 has an amazing screen. Samsung kept to the 5.7″ Super AMOLED formula but curved it on both sides like an edge phone. It has QHD resolution, naturally, but is among the first mobile displays to feature HDR support – a feature borrowed from 4K TVs that allows the screen to show more colors and scenes with very high contrast. The S Pen promises a ballpoint pen-like experience. The stylus can leave notes on the Always on screen. And it can write underwater! Other new features include a text magnifying glass, a translate tool, even a GIF creator. The Note7 is secure. It adds an iris scanner to its arsenal of biometric sensors. Soon, it will be able to replace the fingerprint reader as the way to secure Samsung Pay, Knox and your personal files (hidden in the Secure folder). You can still use the fingerprint reader, of course. Both will be available to third-party apps through Samsung Pass. 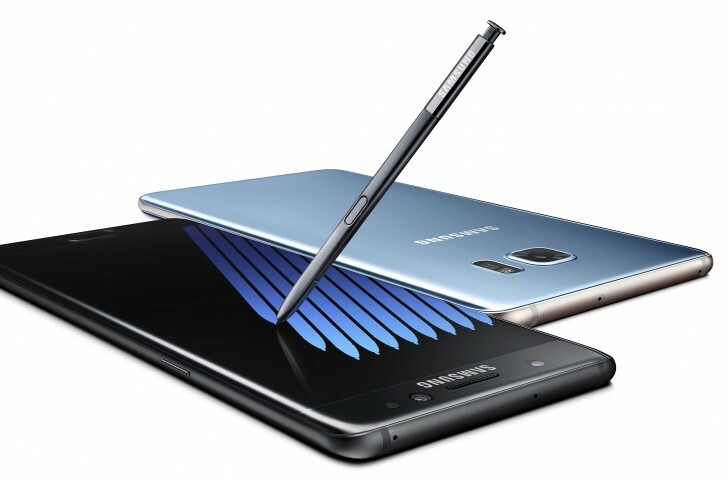 The Note7 is Samsung’s first with USB Type-C. The port supports On The Go and quick charging. There’s wireless quick charging too, to fill the 3,500mAh battery in a hurry (yes, it’s 100mAh smaller than the S7 edge battery). The 12MP dual-pixel camera from the Galaxy S7 is back. It features a bright f/1.7 aperture and OIS and can record 2160p video. On the front is a 5MP selfie camera, again borrowed from the S7. The Note7 is powerful. It’s powered by a Snapdragon 820 chipset or an Exynos 8890 (depends on region), has 4GB of RAM (the 6GB rumor fizzled out) and 64GB storage. You get a microSD slot, but UFS cards are not supported. There’s no word on a 128GB version yet. Samsung polished its Android 6.0 Marshmallow customizations for the Note7. A bit awkward that it just ahead of the Android 7.0 Nougat launch. The Samsung Galaxy Note7 will go on pre-order tomorrow, August 3. Sales officially start on August 19, at least in the US. All major carriers will offer the phone, plus many retailers. Morelaunch info here. Unlike the S7, the Note7 will not be bundled with a free Gear VR, but for a limited time, you can score a free Gear Fit 2 smart band or a 256GB microSD card.